Save 15%*on New Custom Label Orders! 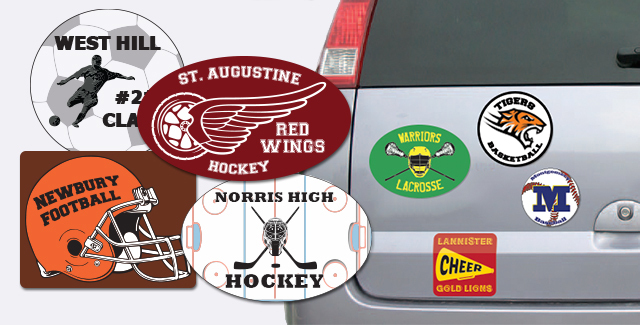 Does your youth sports team or school sports team need customized decals and stickers? Lightning Labels can produce decals and stickers in hundreds of sizes and various shapes, and offers many options for materials and laminates. Whether you need decals for your team’s football helmets, or logo stickers for your gymnastics or cheerleading squad, we’ll get your teams what they need. We have minimum quantities as low as 50 decals, and lightning fast turnaround times. We offer free ground shipping* for orders placed online and personalized customer service - all with a 100% satisfaction guarantee. Youth Sports and High School Sports: Football, Basketball, Baseball, Hockey, Lacrosse, Gymnastics, and more! We have extensive experience printing high quality, custom decals. * 15% off is valid on new label orders. Does not apply to reorders. Maximum discount is $1,000. Free ground shipping applies to orders placed online only and shipped within the United States and Canada. Enter code at checkout. This offer cannot be combined with other offers or promotions. Offer expires 12/31/2018. ** Shipping charges apply for printed press proofs.